For Bowl / Linear feeders New Advance Version constant voltage, Constant frequency controllers for smooth vibration and constant feed rate irrespective of change in supply voltage and frequency for Genset application. Users can adjust output frequency of the controller to best vibration frequencv of the vibratory feeder to get smooth, quiet and energy saving feed effect. Max Adjustable Output Voltage can be preset to protect the vibratory feeder from damage caused by high voltage. 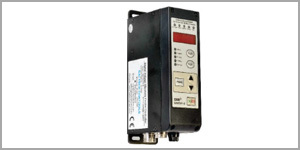 Eliminate feed speed variation caused by mains voltage fluctuation. In order to avoid sudden shock to the feed material and vibratory feeder, the controller can gently increase output voltage from 0 to the preset value when start up. 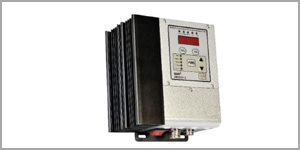 if output current exceeds its rated value by mis-operation, the controller will stop its output to protect the controller and the vibratory feeder. lf internal temperature of the controller gets too high, the controller will stop its output to protect itself. Short-Circuit Protection : lf output of the controller is short-circuited, the fuse inside the controller will be blown to protect the controller and vibratory feeder from further damage. The controller has 2 groups of 0N/0FF control ports. Switch sensor or PLC can be connected to them to turn on/off the controller.